Asien bei Beginn des zweiten jahrhunderts vor Christus. Zeit der Seleuciden und des Turk Reiches der Hiong-nu in Hoch-Asien. 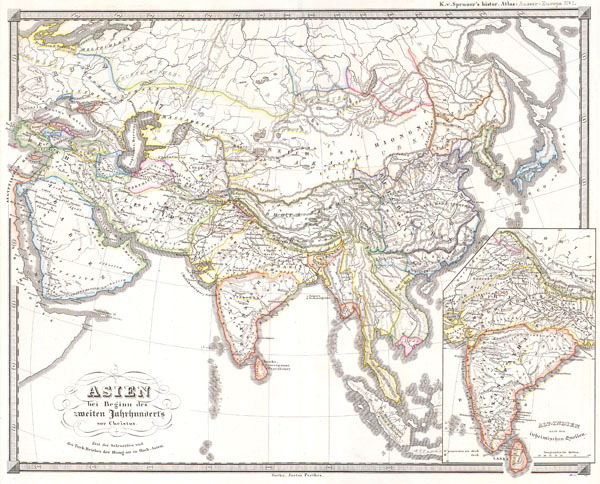 This fascinating hand colored map depicts Asia at the beginning of the 2nd century B.C.E. This period corresponds with the Han dynasty of China, the rise of the Hiongnu Empire in Mongolia, and the Seleucid Turk Empire in Persia. All text is in German, but the title roughly translates as 'Asia with beginning of the second century before Christ. Time of the Seleuciden and the Turk of realm Hiong-nu in High Asia.' Map was originally part of the 1855 edition of Karl von Spruner's Historical Hand Atlas.